Tribute from the monastic community of Kristo Buase for the funeral in Techiman Cathedral, 10th September 2014. 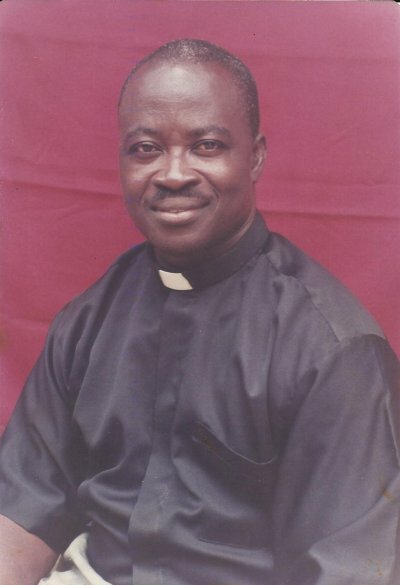 Fr Bartholomew William Kobina Banzie was born in Obuasi, Ashanti Region, on the 28th April 1953. He used to joke that no-one actually came from Obuasi – everyone was simply there as a migrant worker for the gold mines. He considered the village of Nanvilli, in Kaleo parish, of which his father was later Chief, as his true home. He was a Northerner through and through, even though he spent nearly all his life in the South. In recent years Fr Bartholomew hinted several times in his homilies at Mass at having undergone traditional rituals and initiations through his childhood and he retained many traditional beliefs which he valued as part of his cultural heritage as an African and as a Dagao. His Christian journey started later in life. 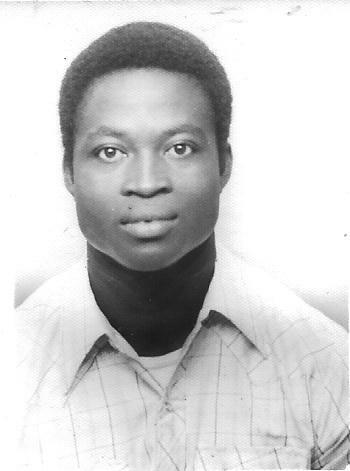 He was already twenty years old when he was baptized at St Paul’s Church, Sekondi, on 30th June 1973, and was confirmed and given first communion the following day. He spent most of the 1970s in Sekondi-Takoradi, studying welding at Takoradi Polytechnic and later employed as an Artisan Welder at the Cocoa Products Factory (GCMB), in Takoradi. Fr Bartho had several catch phrases which he liked to use. One was “It isn’t easy”, and certainly his entry into religious life was a struggle, which took him more than ten years to accomplish. An early attempt to join the FIC brothers in Wa Diocese came to nothing. From 1980-82 he was with Fr Anthony Mensah-Brown as a novice at Divine Providence Monastery in Kumasi diocese, but left before vows. After that he tried his vocation with the Spiritans and joined their novitiate in the Gambia, but that, too, came to nothing and he was sent away. He had done nothing wrong, but the novice master felt he had no particular calling as a missionary. Bartho returned to Ghana, and later described himself as greatly distressed and unhappy at this time. 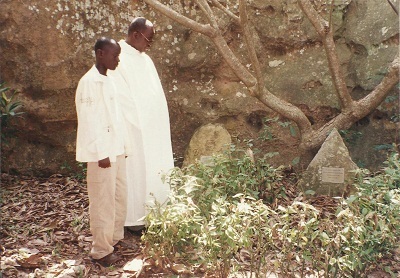 He attached himself to a monastic experimental community at Kuntunase, near Lake Bosomtwi in Ashanti. The brothers there had mostly broken away from Divine Providence Monastery and when that community was given canonical recognition by the Bishop of Kumasi, the bishop advised them that their own small community had no future in the Church. They were advised to disperse and were given three options: to return to Divine Providence Monastery, join the established monastery at Bamenda in Cameroon, or seek to join the new monastic foundation planned for Sunyani Diocese at Tanoboase. 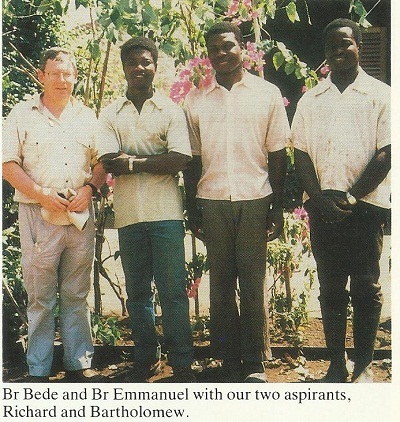 And so it was that in 1986 Bartho made contact with Br Bede Kilgallon and the English monks who were preparing to come to Ghana and was accepted as an aspirant. For the next three years he, and Emmanuel Boateng who had also come to Kristo Buase from the Kuntunase experiment, helped in the preparation of the site and building of the monastery at Kristo Buase. Bartho was at that time living in the sacristy of Tuobodom Catholic Church. 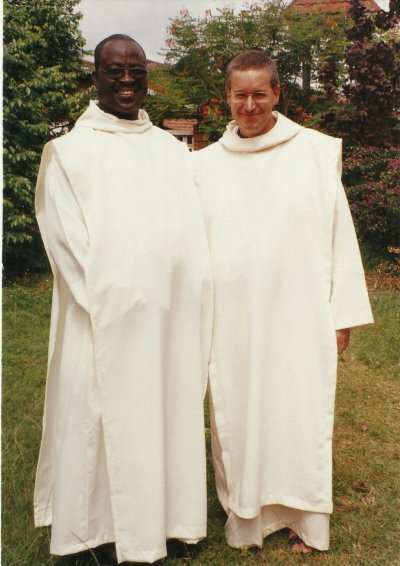 He was accepted as a postulant soon after the canonical opening of Kristo Buase Monastery on 5th August 1989, and was admitted to the novitiate on 8th December 1990, making first vows two years later on 8th December 1992, and then became the first Ghanaian member of the community to make Solemn Vows. That event took place at the monastery on 16th May 1996, Ascension Day. Shortly before his final profession, he travelled to Britain for three months to represent the Kristo Buase community at the centenary celebrations at Prinknash Abbey. That was the first time I myself met him. He was warm and enthusiastic about Kristo Buase and encouraged me to come and visit the community. Another of the British monks, who knew him in the early days of Kristo Buase has commented on how much he owed Fr Bartho, not least as a guide to Ghanaian culture. Soon after Solemn Vows, Bartho was sent for studies for the priesthood. 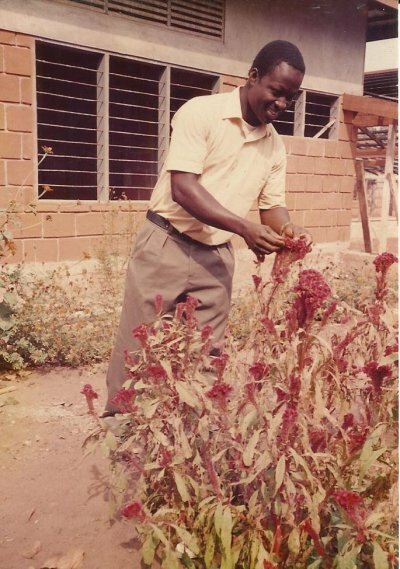 He spent three years with the Spiritans at Ejisu, and then four years with the SVD community in Tamale while studying at St Victor’s Seminary. There was a large age-gap between him and most of the other students since he was already in his forties, but he made many friendships during this period and many Spiritan and SVD priests regularly sent greetings to “Uncle” and called in to visit him at the monastery. Most of his class-mates are now missionaries overseas. These seven years away from his monastery brought several problems Fr Bartho had been encountering earlier to a head. After ordination to the priesthood he began to wonder about a more pastoral vocation and was looking for opportunities to move abroad, particularly to the United States of America. When various plans fell through, he arranged to spend one year in Trinidad giving pastoral assistance at Mount St Benedict Abbey. The work permit arrived in July of last year, but the Lord had other plans for him, and while we were planning his journey his health suddenly deteriorated and the heart condition he had been struggling with for the past ten years finally caught up with him. He died peacefully on the night of Monday 18th August, in the presence of one of his monastic brothers. He was 61 years old, 10 years a priest, and 21 years professed as a monk. Fr Bartho had known for many years that he was likely to die young. He often told us that he liked to pray the rosary in the monastery’s cemetery, meditating on where he would be laid to rest. And today we shall bring him to the end of his earthly journey, to bury him beside Fr Martin Symons who had been his Superior and Novice Master when he first entered the monastery twenty-five years ago. May the Lord now grant him that peace he sought so long, and show him his mercy and love. Amen.